The other day, I was reading in the Bible about the blind beggar. In the book of Mark, the author tells us that the beggar was on the side of the road as Jesus was passing by. Knowing that Jesus was the Healer, the beggar began to call our to Him. At that point, Jesus turns to him and asks, "What do you want me to do for you?" I've always wondered why Jesus made the beggar verbalize his need. I'm sure it wasn't to give Jesus clarity, because He is all knowing. Perhaps it was to cause the beggar to really stop and think what he wanted. I'm sure as the beggar searched his heart, he probably had many requests he'd love Jesus to grant, but being forced to pinpoint his desire made him choose the most important thing. The beggar wanted his sight. That was the one thing he needed Jesus to do for him - heal his blindness. And Jesus did. 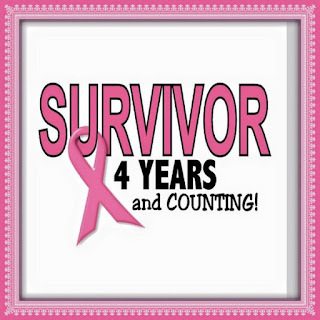 I just celebrated my fourth cancerversary. This year was very low key. My husband, two of my children, their significant others, and one of my grandchildren went out to a restaurant to eat then came home for cake. The day was pleasant and although we didn't have a big celebration, as we'd done in the past, it was significant to mark the passing of another year since diagnosis. Celebrating my fourth year since being diagnosed with cancer made me stop and think back to the story of the beggar. What did I really want? What did I want Jesus to do for me? In my heart, I knew what I really wanted. I wanted to live more than just one more year. Making it to the elusive five year post cancer mark wasn't going to be good enough. I needed more! I wanted more! I wanted to live a long and happy life. I wanted to grow old and watch my grandchildren grow up. Of course, truth be told, I wish I'd never been diagnosed with breast cancer in the first place and if I'd ever had the opportunity, I would have asked Jesus to completely rewind my life and allow me not to have experienced cancer but He doesn't work that way. As each year since diagnosis has passed, I realize all of this was part of His divine plan for my life. You see, without my having to take the hard road through cancer, I would never have learned the valuable lessons I've learned along the way. When the blind man was on the side of the road calling to Jesus, he was desperate. He wanted to be healed and he knew Jesus had the power to give him the gift of sight. His faith in Jesus was manifest when Jesus required the man to verbalize his need. If the beggar had chosen to ask Jesus for something other than his sight, I doubt Jesus would have answered the request. Jesus, able to see into our hearts and minds, weighs carefully our needs. He always knows what's best for us even when we don't have that knowledge ourselves. I could have asked Jesus to remove the cancerous tumor from my body and He might have done it if it fit into His perfect will for my life but, I never asked. Throughout my life, I've learned to trust whatever He sends my way, be it good or bad because I know each comes directly from His hand into my life for a reason. My prayers now revolve around my desire to live as long as God will allow. It is my heart's desire that my life will be a blessing to others and that God will the receive glory. Each moment, each hour, each day He gives has been a gift and one I don't take lightly. Before cancer, I took so much for granted. Have you ever thought about what you really want? If Jesus were standing before you, what request would you present to Him? Would you be willing to verbalize your need boldly like the beggar did? Jesus said, in John 11: 25-26, "I am the resurrection and the life. The one who believes in Me will live, even though they die; and whoever lives by believing in Me will never die. Do you believe this?" You can have eternal life by believing in Jesus. You can be assured that you will be with Him through all eternity. It's very simple. If you'd like more information, click here. To read the story of the blind beggar, click here.